If you need a temporary storage space for all the boxes in your garage, you need to rent a truck, load it up with the boxes, drive everything to a storage facility, unload the truck into one storage unit and return the truck to the rental company. If you&apos;re moving, you coordinate a pickup date with the moving company. Before that date, your house becomes more and more unusable as it becomes a sea of packing materials. When the moving date arrives, movers load your stuff onto their trucks. Then, you have to coordinate a drop-off day and time with them at your new location. When that date arrives, you wait for the movers to come and unload your stuff. You then unpack as best you can before tumbling into bed, dead-tired. Neither alternative is exactly a walk in the park. 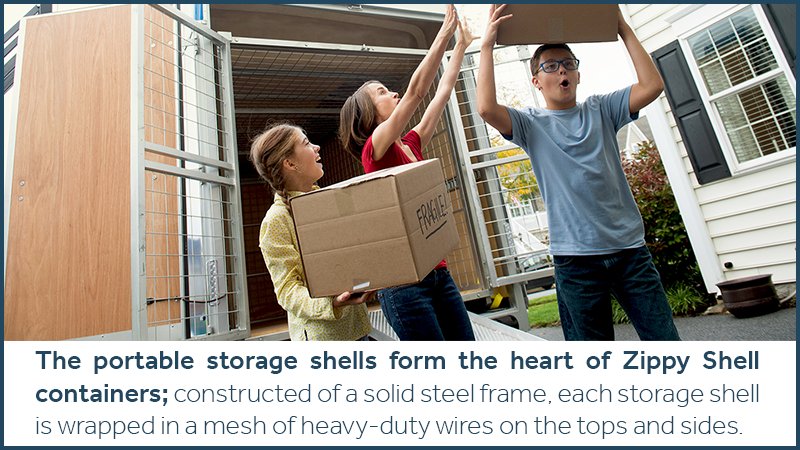 Fortunately, Zippy Shell eliminates many of these hassles with their unique storage containers, which consists of two parts: shells and trailers. The portable shells form the heart of Zippy Shell containers; constructed of a solid steel frame, each shell is wrapped in a mesh of heavy-duty wires on the tops and sides. These materials make the pod lightweight, easier to move around and relatively inexpensive when compared to heavy, unwieldy and costly containers with solid steel sides. The savings in both time and money are passed on to customers like you. Because the mesh increases the number of locations for attaching cables, it allows more flexibility in tying down your goods. Your valuable items are more securely held in place, preventing them from excessive jostling and movement, which can cause damage. The wire sides allow the contents of a container to breath, even after it is wrapped in transparent plastic and stored in a climate-controlled warehouse. Your possessions do not suffer from the musty odors that typically come from items that are kept out of sight for too long. In addition, because you can easily see through the wire mesh, you can conveniently find your possessions just by walking around the shell. With a solid storage container, the only way to be sure if grandma&apos;s antique sideboard is at the far end is to unload all the boxes. You don&apos;t have to worry about renting or borrowing a truck and driving to an unsafe area to pick up a container. It&apos;s delivered to you inside a solid and secure trailer that is street legal so that it can be placed in your driveway, in a parking space or even at the nearest curb. You can load the shell inside the trailer at your leisure, so you don&apos;t have to worry about boxes piling up inside your home. When you&apos;re ready for us to store your pod, just give us a call and we pick it up. 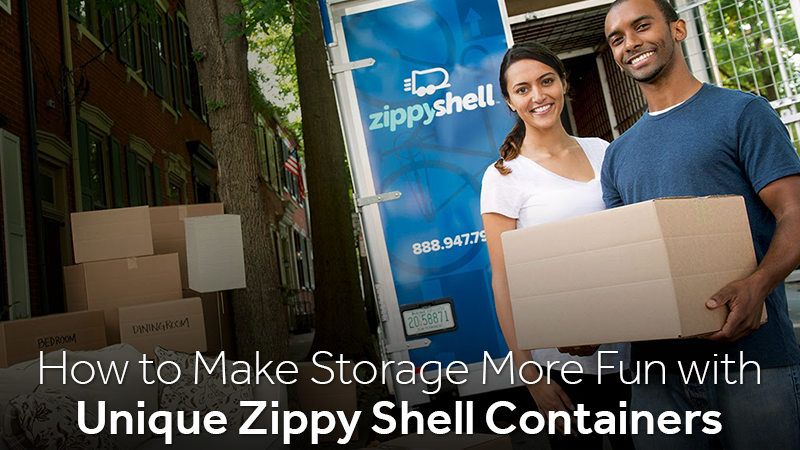 Zippy Shell storage containers are a fun way to store your stuff and move! Contact us at the West Houston location to see how we can help you.